Tell story based on Luke 15:11-32. You can act out the story with props: A stack of play money eg monopoly notes (or you can make your own play money! ), a bowl, a robe (or coat), ring, shoes (can use the shoes of the child who is acting as the younger son), balloons, and banner to read, “Welcome home, son.” The teacher or someone who can read well can narrate while the children act out the play. There was a man who had two sons. One day, the younger son said to his father, ‘Give me now the part of your property that will be mine.’ So the father divided his wealth between his two sons. (Father gives the play money in equal proportion to both sons). A few days later the younger son took all that he had and left home. He traveled far away to another country, and there he wasted his money on wild living. After he spent everything he had, there was a terrible famine throughout the country. He was hungry and needed money. So he went and got a job with one of the people who lived there. The man sent him into the fields to feed pigs. To the Jews, pigs were unclean (haram) and it was a terrible job to have to look after pigs because they were smelly. The younger son was so hungry that he wanted to eat the food the pigs were eating. (The son reaches his hand out the bowl, but pulls it back). But no one gave him anything. The son realized that he had been very foolish. He thought, ‘All my father’s hired workers have plenty of food. But here I am, almost dead because I have nothing to eat. I will leave and go to my father. I will say to him: Father, I have sinned against God and have done wrong to you. I am no longer worthy to be called your son. Take me as one of your hired workers.’ So he left and went to his father. But the father said to his servants, ‘Hurry! Bring the best robe and put it on him. Also, put a ring on his finger and sandals on his feet. And bring the fattened calf and kill it so that we can celebrate with plenty to eat. My son was dead, but now he is alive again! He was lost, but now he is found!’ So they began to have a party. What can we learn from the story of the lost sons? The father loved his sons despite of what they did. Younger son: Even though his son disrespected him and squandered his inheritance, the father still longed for him to come home. He waited and watched every day. In those days, there were no photos, e-mail, or Facebook. He didn’t know where his son was, whether he was still alive, but he waited day after day, month after month, year after year. Finally when his son came home, he ran to meet him. He probably looked quite silly running and exposing his legs. He was a rich man and had many servants. But he didn’t care about looking silly. All he could think about was that his son, whom he loved dearly, had come home. Even though we were sinners, God saw our need to be saved and he sent Jesus to save us. Jesus went through terrible beatings, was made fun of and suffered a very painful death on the cross. He gave up everything for us, even his life. God longs and waits for all His children to come home to him. He waits for each one to receive Jesus as his or her personal Saviour. When we do that, He is overjoyed, like the father. That is how important we are to him. Older son: The older son didn’t want to join the party. He sulked and pouted outside the house. That was a show of disrespect also. But the father still showed love to him — he went out and pleaded with his son. The younger son decided to go home and ask his father to let him be a servant after he didn’t have enough food to eat. He remembered how rich his father was, but he didn’t realized how much his father loved him and was willing to forgive him despite of what he did. His father gave him more than he asked. Instead of being a servant, he was received as a son. His father even threw a party for him. To his father, he was always a son, never a servant. The older son was unhappy that his father treated his brother so well. After all, his brother had wasted all his money. All his (older brother) life, he tried to please his father by working hard for him, not realizing that his father loved him unconditionally and all his father’s possessions belonged to him. He thought himself as his father’s servant, when he was actually his son. Even though the older son was with the father all this while, he was still “lost” because he didn’t know his position. To God, we are not his servants. We are his children, very much loved by him. He doesn’t look at how much we serve him, how clever or gifted we are. He accepts us because of Jesus has done on the cross, that he has taken away our sins. 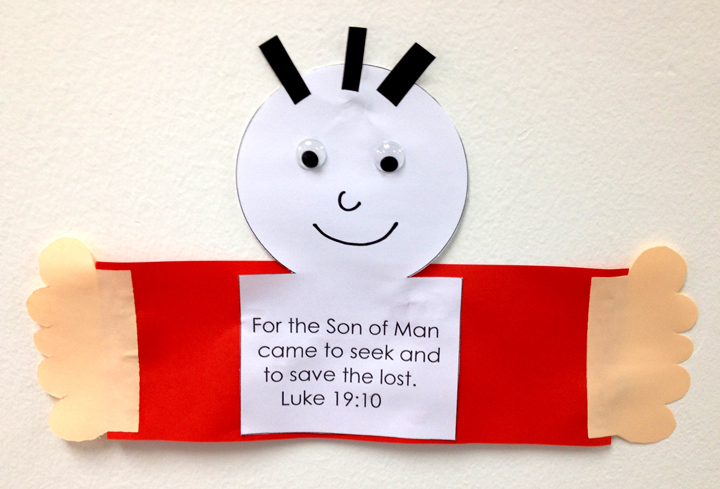 Prayer: Ask if any children want to receive Jesus as their Saviour and pray with them.